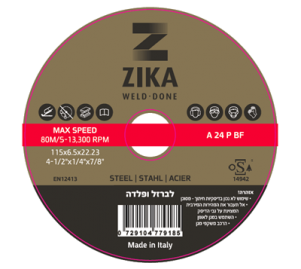 Metal Grinding Disc – Zika Industries Ltd.
Home Catalog Abrasive Products Metal Grinding Disc – Zika Industries Ltd.
Metal grinding disc enables high removal capacity for various types metals for maximum performance and life. Used for profile plates, iron constructions. Generally used for sharpening surfaces, removing rust and honing welds. * Our discs are manufactured in Italy, OSA approved and for use in angle grinders.